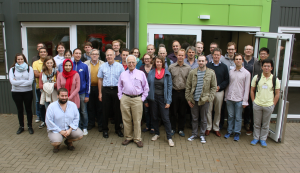 The Graduiertenkolleg ‘Combinatorial Structures in Geometry‘ at the University of Osnabrück is a project funded by the German Research Foundation (DFG). It enables research and scientific education within and between algebra/discrete mathematics, applied analysis, stochastics and topology/ geometry and combinatorial optimisation. In order to celebrate the first three years of its existence and the completion of the first eight PhD-thesis supervisioned in this project we organize an international conference on Combinatorial Structures in Geometry.